Heat oven to 400°F. On ungreased cookie sheet, unroll dough into 14x9-inch rectangle. Sprinkle Parmesan cheese, onion powder and caraway seed over dough; press in lightly. Bake 12 to 16 minutes or until golden brown. Cut crust into quarters; separate slightly. Spread each with 1 tablespoon dressing. Top each with pastrami and cheese. Bake 2 to 4 minutes longer or until thoroughly heated and cheese is melted. Top each with coleslaw. 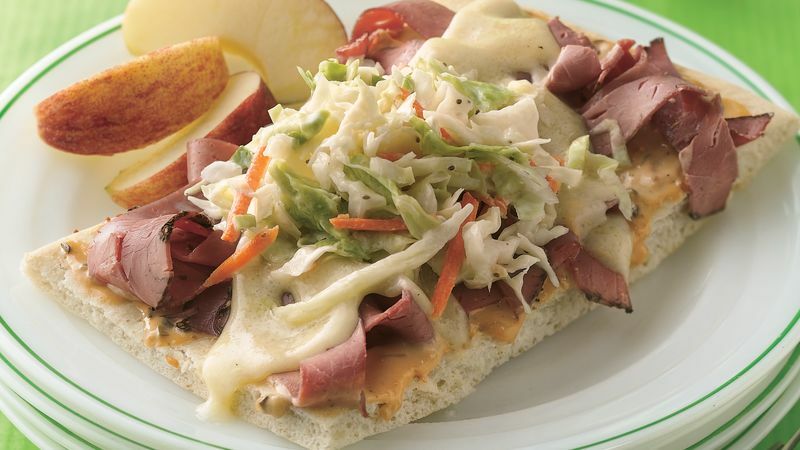 If your family isn't fond of Thousand Island dressing, use mayonnaise or a blend of mustard and mayonnaise instead. Tuck a kosher dill pickle next to the sandwich and add fresh baby-cut carrots and wedges of apple, pineapple and orange for a satisfying supper.